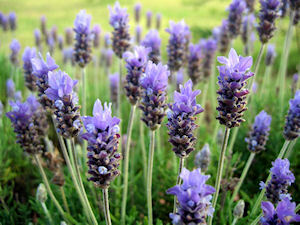 Beyond the beauty and fragrance of lavender is the fact that it is an herb….much like mint or thyme or basil. It may not be an herb that has a place in your spice cabinet, but it has been in use as a culinary herb for centuries. Herbs de Provence is a combination of several herbs, but lavender is what sets it apart from other spice blends. Lavender varies in taste much like it does in appearance and aroma. Lavender can be substituted in any recipe that calls for Rosemary, Thyme or Mint. English lavenders will have a milder, sweeter fragrance and taste than that of Lavandins (L.Angustifolias) which are astringent and camphorous. We recommend the pink-flowered English Melissa because of its sweet, floral note which enhances all dishes from soups, to meats, drinks and desserts. If that cannot be found, I will cook with Lavandin Provence because of its milder flavor. Some cooks prefer it to the English varieties. Tumalo Lavender culinary lavender blends well with berries, meats, drinks, most herbs. It is an outstanding addition to recipes that call for lemon…lemon pound cake, lemonade, lemon chicken. When cooking with lavender remember a little goes a long way. You can use fresh or dried in your recipes, however, keep in mind that dried has more than double the taste of fresh lavender. Lavender is used to flavor sugar, jellies, cakes, cookies. Start by experimenting and use lavender wherever you would use rosemary or thyme. Tumalo Lavender Mediterranean Blend Herbs de Provence is excellent in a variety of dishes…it’s the lavender that adds the finishing touch! Add it to your spice rack today! Some of my favorite memories are with family members, cooking and creating with lavender. Enjoy some of the recipes I have collected and created using lavender. Combine all ingredients in a large bowl, add chicken & coat. Cover and refrigerate for 4 hours. Preheat grill to medium, place chicken, skin side down, on grill and cook until juices run clear, basting with left-over marinade several times. Blend above ingredient together in a medium mixing bowl, stir in 1 tsp culinary lavender buds. Add mint leaves, lime juice and Lavender syrup to a cocktail shaker and muddle together. Add ice and rum, shake and pour into a tall glass. Add club soda to taste and garnish as desired.